Visiting Six Flags New England for the first time? These tips will help you avoid learning hard lessons during your family's visit to New England's largest theme park in Agawam, Massachusetts. Arm yourself with this information, and you and your family will have a better shot of screaming for only the right reasons during your day at the park. The official Six Flags New England parking lot is farther away from the action than you might expect. This makes returning to your car to fetch swimsuits, or anything else you've left behind, impractical. It's easily a half-hour trek. In order to get back to your car, you'll need to exit the park (and have your hand stamped if you plan to return), climb tall stairs, or navigate a long ramp to a walkway over Route 159, descend and catch a tram, then walk a considerable distance to your car. The only alternative is to pay more and take advantage of preferred parking. While you may be able to save a bit on parking by leaving your car in one of the privately owned lots you'll see along Route 159 as you approach the park, keep in mind that you'll still need to walk inside the main parking entrance and cross the bridge over Route 159 in order to reach the Six Flags New England entry gates. 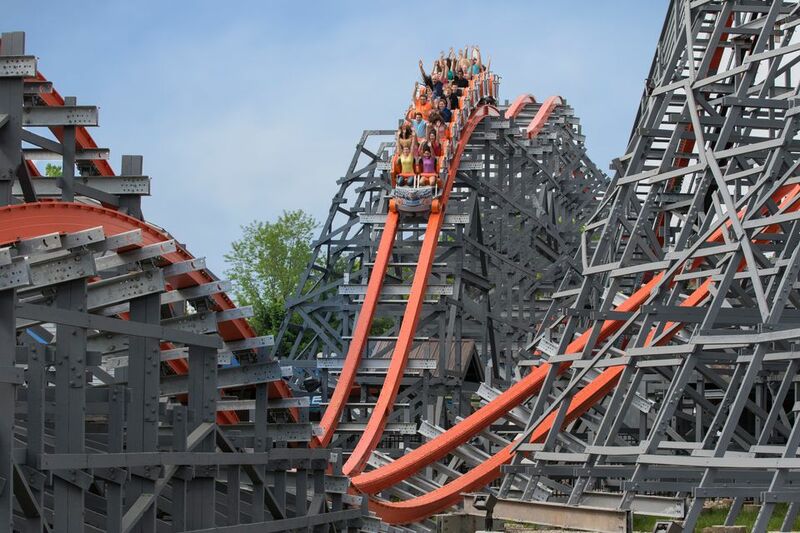 Six Flags New England is a destination for serious adrenaline junkies: You may find your palms sweating and your heart racing just watching some of the park's roller coasters and other thrill rides in action. This place is for thrill seekers, and the park has very few tame rides for grown-ups visiting without little children. When Wiggles World and Thomas Town debuted in 2007 at Six Flags New England, the theme park—which already had a Looney Tunes Movie Town area catering to little kids—solidified its position as the region's leading provider of entertainment for preschoolers. The Wiggles and Thomas branding have been gone since 2010, but the rides in these areas—now dubbed KIDZOPOLIS—remain the same. Early-elementary aged children are a bit beyond the Krazy Kars and Whirlybirdz helicopter rides, but they may not be ready for the majority of the park's livelier rides. They may not even meet the height requirement for the Stampede Bumper Cars (48" to ride with an adult). If you'll be visiting the park with grade schoolers, it's a good idea to review the Six Flags New England ride guide, which provides thrill ratings and height requirements for each ride, before leaving home. Before you head for Six Flags New England, think about your attire. Wearing white pants or a white shirt is a no-no: Anything white will be filthy by day's end. Here's another tip from experience: Leave dangly earrings without backs at home, or you may watch in helpless horror as one flies out of your ear, bounces across the floor and falls through a crack in the floor of the Krazy Kups ride. One thing you should wear when visiting Six Flags New England is sunscreen. If you do happen to dress wrong for the day, or if you fail to carry extra clothes along and you don't want to make the long trip back to the parking lot when your kids are soaked and shivering after water rides like Blizzard River, you'll be glad Six Flags New England has retail stores that sell T-shirts and sweatshirts. And, if you have your AAA membership card with you, you'll save 10 percent on merchandise purchases of $15 or more. Next time, you'll remember to carry a waterproof tote with a change of clothes. Six Flags New England's rule that bathing suits may only be worn within the Hurricane Harbor water park further compounds the problem of choosing attire for a day at the park. If you don't relish the idea of carrying a big bag of suits and towels on all the other theme park rides, you'll largely be limited to wading into Commotion Ocean—a 500,000-gallon wave pool—and you'll miss out on the rest of the water park rides. Wearing a swimsuit under your clothing may be a solution, but you still have to deal with toting wet gear around after your Hurricane Harbor stop. Lockers are available, but the price is insane, plus you'll pay a key deposit on top of it. And, lockers need to be emptied before Hurricane Harbor closes, which is earlier than the rest of the theme park. Because Hurricane Harbor offers so many options for water play, the best strategy may be to choose to spend the entire day at the water park on a hot day, rather than attempting to do both the amusement and water park in one day. Don't find out the hardest way possible that there's only one way in and out of Hurricane Harbor. If you walk toward Hooks Lagoon and the Tornado water funnel ride, you'll discover that there is no exit from the water park once you reach the end—you have to return to the entrance. If you're working off a big meal of greasy, fried park food, you might not mind. But if your little kids are spent by this point, you may be faced with an awfully long piggyback ride back out of the water park. If you're a coaster wimp, you can always see live shows. But beware: You may be dismayed if you time your visit wrong. The summer entertainment schedule available at the entrance gate will tell you where to see Six Flags New England's premier shows, which run several times daily—except Tuesday! If you're already there, and it's Tuesday, well... your entertainment options will be extremely meager. Call the Six Flags New England information phone number, 413-786-9300, if you want to check show schedules ahead of your visit. Bugs Bunny, Daffy Duck, the ​Tasmanian Devil, Marvin Martian, Yosemite Sam: They're all classic cartoon characters you probably remember from childhood, but to most kids these days, they are strange, unfamiliar beings. That makes meeting the characters at Six Flags New England much less of a priority than it is at Disney World. Before you visit the park, though, you may want to watch a few Looney Tunes videos online with your offspring. Admission to Six Flags New England is expensive (be sure to take a look at coupon and discount offers before you go), but even more surprising is how much more money you can drop once you're inside the park. Be prepared to spend about as much inside the park as you did to get in the gate. Pack sandwiches to eat on your car trip to the park if you want to save a few bucks on food. Remember to bring a change of clothes, so you won't have to shell out for a sweatshirt. And try to avoid Whack-a-Mole and other carnival-style games, which can set you back $5 or more per person.